In the first post of this series I described the initial situation (Impact of ACM Implementation on BAM). This post ended up with the following challenge. We have a ACM Case consisting of about thirty Case Activities. The Case and the individual Case Activities are housed in a private composite (1 + ~30 composites). Challenge: How can we group/filter in BAM by ‘specific’ metrics that are present in each Composite. For example ‘Department ‘. In the second post Filtering/grouping in BAM by ‘specific’ metrics (explored solutions) I have 10 recognized/examined solutions appointed for this challenge. In this post one of these solutions (number 10) is further developed. 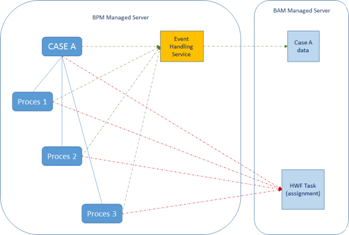 An ACM Case Management composite (CASE A) with the Case Activities implemented in external BPM processes (Proces 1,2 and 3). The humantask metrics are available in BAM via the ‘default’ channel. For other metrics the composites have to send events. These events are catched by the Event Handling Service. This service puts them on the JMS Queue BAM uses as input source. Graphically represented: Read the complete article here.